In small bowl, mix Garlic Parmesan Aioli ingredients; cover and refrigerate. Heat gas or charcoal grill. In medium bowl, mix beef, bread crumbs, milk, salt, pepper and onion. Shape mixture into 4 patties, about 1/2 inch thick. Make indentation the size of a quarter in center of each burger so burgers remain level during grilling. Place patties on grill over medium heat. Cover grill; cook 10 to 12 minutes, turning once, until meat thermometer inserted in center of patties reads 160°F. Toss green and red bell pepper rings with oil to coat. Add bell pepper rings to side of grill for last 8 to 10 minutes of cooking, turning once, until crisp-tender. During last 2 minutes of cooking, top each patty with cheese. Cook until cheese is melted. Spread about 1 tablespoon Garlic Parmesan Aioli mixture on cut sides of buns. 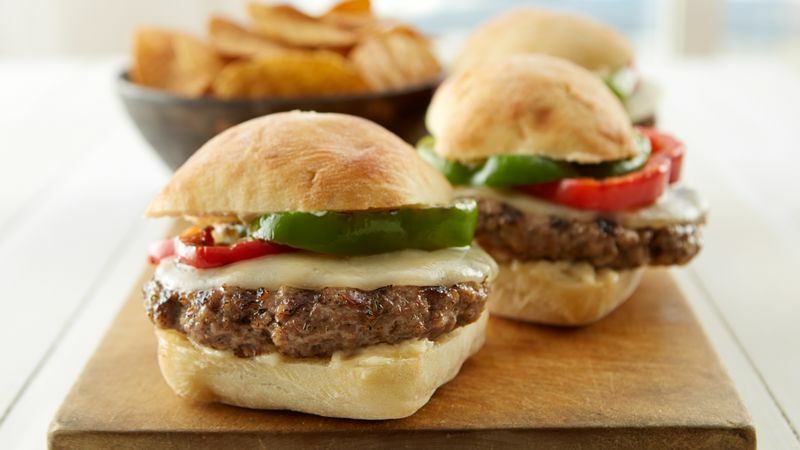 Place burgers on bottom halves of buns; top with peppers. Cover with top halves of buns. The ciabatta buns can be grilled to make them toasty. Brush the cut sides with olive oil, if desired, and grill during the last 2 to 3 minutes of cooking time. Provolone cheese is a creamy white cheese with a mild smoky flavor that melts well. Mozzarella can substituted.